A campaign to double the number of tigers in the wild by 2022 was on the agenda last Sunday at the highest-level political meeting to ever discuss a single species. 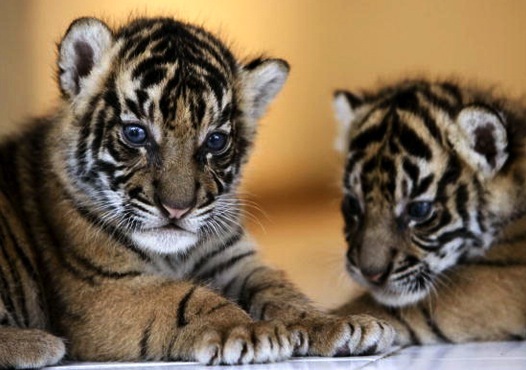 The International Tiger Forum in St Petersburg, Russia, is being staged in response to a calamitous 97% decline in tigers in the wild over a century. The forum will last until Wednesday 22nd November. The forum – which is taking place during the international year of biodiversity and the Chinese year of the tiger – will also include the unveiling of an international consortium to combat wildlife crime and pledges to tighten protection by the 13 countries where tigers live. Even actor Leonardo DiCaprio and the model Naomi Campbell will be getting in on the act to help translate words into actions. This is great news considering the wild population of tigers has shrunk to less than 3,200 tigers from over 100,000. The loss of a species at the top of the food chain will have a dramatic affect on all creatures below. At the end of the summit, leaders are expected to adopt a global tiger recovery programme that includes a target of doubling numbers by 2022, making core tiger areas inviolate, increasing public awareness of tiger conservation, setting up cross-boundary protected areas and cracking down on poaching and smuggling. While tigers once roamed in at least 25 countries at the start of the 20th century, today they are in dwindling, separated communities across just 13 nations.The remaining populations are as follows: India 1,200-1650; Indonesia 450-700; Bangladesh 400; Nepal 350; Russia 350; Bhutan 70-80; China 40-50; Cambodia 10-50; Laos 50; Vietnam less than 30; Burma about 100; Thailand 250-500; Malaysia 300-500. The question now is when will the rubber hit the road.